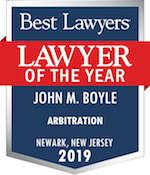 John M. Boyle :: Westfield ADR Lawyers Lindabury, McCormick, Estabrook & Cooper, P.C. Jack Boyle concentrates his practice in the areas of mediation and arbitration. Jack Boyle joined Lindabury’s Alternative Dispute Resolution practice in March of 2002. Since that time he has provided mediation or arbitration services in over 700 matters, covering a wide range of legal disputes. He is a former Presiding Judge in the Equity Part of the Chancery Division, Superior Court, Union County, where he served for 10 years. For the balance of the more than 17 years he was on the bench, Mr. Boyle was judge in the Probate and Matrimonial Parts of the Chancery Division and in the Law Division handling jury trials. While serving in the Equity Part of the Chancery Division, Mr. Boyle adjudicated thousands of cases, resulting in hundreds of settlements in all areas of equity, probate and complex civil disputes, including environmental, real estate, contracts, construction, products liability, personal injury, securities; stock valuations, insurance coverage and commercial and corporate disputes such as directors’ liability and minority shareholder rights. 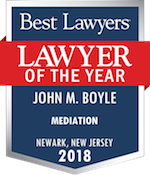 In 2012 & 2013 Mr. Boyle was named one of the “Best Individual Mediators” in New Jersey. This selection was based on a survey of the legal community conducted by the New Jersey Law Journal. Prior to serving in the judiciary, Mr. Boyle was in private practice with Sauer, Boyle, Dwyer and Canellis, Esqs., which had offices in Westfield, Elizabeth, Somerville and Union. He practiced for 30 years as a senior partner at the firm. His practice was concentrated in the areas of contracts, real estate, governmental law, zoning, planning and general litigation. Representative clients include the City of Elizabeth, Elizabeth Federal Savings, St. Elizabeth Hospital, Union County Multiple Listing Service, Eastern Union County Board of Realtors, Humble Oil, The Daily Journal, Foodfair Stores and Getty Oil. While in private practice, Mr. Boyle was chief counsel in the second Jackman v. Bodine case, 44 N.J. 491, 205 A2d 648, involving “one man, one vote” issues, and other notable trials. Mr. Boyle has also served as Chairman and Secretary for the Planning Board of the City of Elizabeth; Councilman for City of Elizabeth; Assistant City Attorney and City Attorney for City of Elizabeth; and the Legislative Committee of New Jersey’s League of Municipalities. Mr. Boyle is a member of the International Society of Barristers, a Fellow of the American Bar Foundation and the founding president of the Richard J. Hughes American Inn of Court. He has advanced judicial education from Harvard Law School, the Judicial College in Reno and the University of Kansas. He served as a participating Judge in the 16th Annual Yale Mock Trial Association hearings in New Haven, CT.
Certified Arbitrator and Mediator by Federal District Court for District of New Jersey.